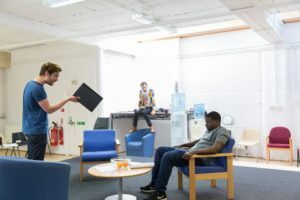 The semantics of an argument between a senior and junior doctor form the basis of Blue/Orange, Joe Penhall’s play about a young black man who has been confined in a psychiatric ward. 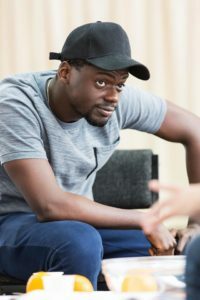 Matthew Xia directs a revival of Blue/Orange at the Young Vic Theatre between 12th May and 2 nd July, with Daniel Kaluuya, David Haig and Luke Norris in the cast. Science Centre Stage spoke to Matthew Xia about the process of staging this revival in the current climate of change in the NHS, about using words to create illusion and misdirection and the current place of medicine in theatre. 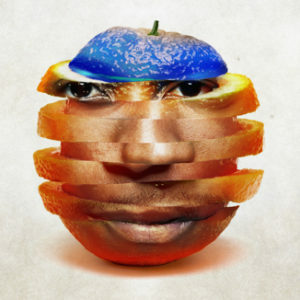 Can you give a little background to Blue/Orange and what it is about? 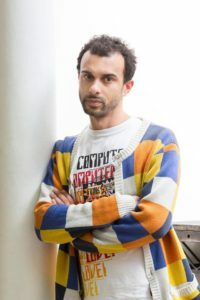 Blue/Orange was written towards the end of the late nineties by Joe Penhall in what was at the time his most successful play. It won the Olivier Award for Best New Play in 2000. The original production at the National Theatre starred Bill Nighy, Andrew Lincoln and Chiwetel Ejiofor. Sixteen years later we want to explore the same themes which feel ever more pertinent. There’s certainly a series of crises concerning junior doctors and beds and resources and all the things that have constantly plagued the NHS. We start on Day 27 of a Section for a young black man called Christopher. He’s in for assessment and treatment over a course of 28 days. He’s on the 27th day, so he’s being released tomorrow. But the junior doctor, who is white, (Christopher is black) thinks that there is something in the diagnosis that is inaccurate and would like to have him stay for up to six months. In order to do that he needs the agreement of his senior consultant called Robert Smith. 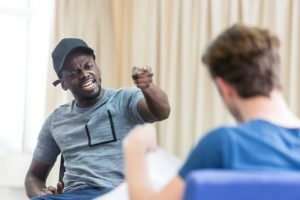 Ultimately the play is looking at the potentially subjective nature of diagnosis, particularly in psychiatry, and how that is affected by things such as unconscious bias, ethnocentricity, cultural specificity, and how these things cause us as humans to make subjective diagnoses, even with our best will and best intent in mind. What the play really tries to tackle and what I’m personally interested in, is first, the kind of diametric argument that is presented. Joe Penhall’s great at writing complex, nuanced, detailed arguments. Secondly, you’ve got these two white doctors and their black patient so I guess the other thing that it really explores is the power structures inherent in patient-doctor dynamics and how that might have a bearing on diagnosis. It also explores the power structures within the relationship between a senior and a junior doctor and the expectations upon both of them in those roles. Did you consult with doctors and psychiatrists during the development process to help understand the system they operate in? Yes, certainly. My process anyway is to completely immerse myself in the world that the characters live in. The mental health guidelines from 1997, government documents, white papers, testimonials and a brilliant book called Users and Abusers of Psychiatry were really useful in the rehearsal room. The next stage was that the designer (Jeremy Herbert) and myself went along to the Maudsley Hospital. The play isn’t set in the Maudsley but it’s the crown jewel of mental health facilities. I went down there and spoke to occupational therapists who gave us a tour of the building so we started to get an idea of the environment that these people would be working in. We met a brilliant man called Dr. Neil Brenner who is a consultant psychiatrist and had the most incredible array of stories and experiences. We’d read him small bits of the play and he’d respond to them, which gave us a sense of the truth of the world that we were trying to replicate and also some guidance on how far we could stray from the truth with the production. How do you challenge without offending, upsetting or crossing the status boundary? At at the turn of this century there was a very clear hierarchy [in medicine]. The junior doctor in this play is ideological and principled and that leads him to challenge his senior quite a lot. Dr. Neil Brenner says he would be out on his ear, immediately. It was useful because it actually meant we could temper some of those challenges. Then there is a much more interesting game to navigate. How do you challenge without offending, upsetting or crossing the status boundary? I think this makes for a much more interesting reading than a hot headed, fiery, junior doctor who doesn’t quite know his position. Given that you were told Joe Penhall was something of a soothsayer for predicting future changes in the NHS back in 2000, do you think the play says anything about future patterns and how things might develop from here? Or is it more of a snapshot of where things are? I think it’s more of a snapshot of where things are but I think that brilliant thing of putting a play on at a different time to when it was written means that it becomes a prism that refracts today’s thinking and understanding. You spot new patterns and different correlations that maybe weren’t so readily apparent the first time round. I think we live in a very different, much darker world than we did in 2000, a kind of post 9/11 world. Christopher thinks his father might be Idi Amin at one point – that’s ambiguous, and it’s meant to be ambiguous. Is his father Idi Amin or not? But he says at one point he’s a Muslim fundamentalist. Now in 2000 that would have rung out in such a different way to how it rings out now. This man being attracted to this hugely powerful Muslim extremist- it says something very different. So I guess my point is that the play has stayed the same. We have changed and it will be interesting to see how that relationship between audience and piece has changed because of the shift in society. Does your interest and background in illusion have any bearing on your work in theatre? I think they are quite separate interests for me. My interest in illusion is an interest in amazing people and in small theatrical events and happenings. In my last show (Into the Woods) it was much easier to employ magic and trickery in a fairytale land. I think where the magic actually comes into Blue/Orange is that it’s ultimately a play about semantics and the inherent power of words and the slipperiness of words. Of course that was all coming out of people like Alastair Campbell and the Blairites – that was the world that this play was written in. Spin was huge. Somebody of a particular class or esteemed in a particular fashion could say something that meant one thing and if somebody else said it – it meant something completely different. It was a game of rhetoric. I think that’s the sort of magic that I’ve become interested in in the last ten years – the misdirection of words and the use of words to mask and create smoke and mirrors. That is almost certainly within the play. 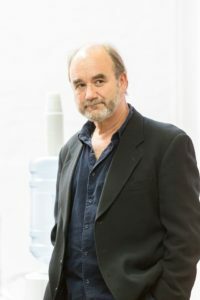 The character that David Haig plays is so manipulative and controlling and Machiavellian in the way that he uses his words. He’s incredibly calculating, incredibly deft with his deployment of words. I’ve always had that interest in magic and it’s something that’s come to the forefront more recently with psychological illusionists. 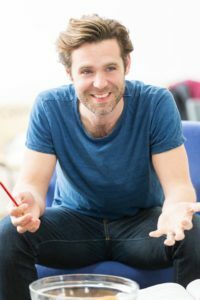 Given that you have quite a small cast, how does your rehearsal process work – do you like to work with the writer in the room? I spent a lot of time with Joe in the casting of the show and very early on in rehearsal. He came in and pointed out where the pitfalls were to be found or the problematic spots or certain things that we just have to get right with this play otherwise is just doesn’t quite work in the way that it’s meant to. It’s incredibly useful, incredibly helpful. But I think as with all plays ultimately, even if it’s a new play, at some point the writer needs to leave having known that they’ve done their job, which is to write the play and to pass that over to a team who would then bring it to life. One of the problems with having a writer in the room too long is that everybody looks for direct answers. So as opposed to having an investigative exploratory process you just go ‘why do I say this?’ or ‘why does he do that?’ instead of working through your own system of logic as to why you get from one thought to the other. It’s been great having Joe so close to this production and equally it’s been great, as always, being left to our own devices to make a play. Similarly with designers, do you bring your own ideas beforehand and work through it with them in rehearsal or do you leave it to them to approach you with ideas? The reason that I make theatre and one of the reasons that I enjoy making theatre, is the collaborative nature of the arts. It’s very much me and Jeremy Herbert sat in a room reading the play very badly to each other and then finding what it needs, what it’s about, what moments have to be realized in terms of a pragmatic approach to the work, versus a more abstract conceptual approach. The idea that Christopher is in an institution, what does that mean? One of the decisions that we made is Christopher never leaves the playing area so that you know he is here constantly and it is his life that’s being discussed and that he is completely disempowered in those conversations. And of course time and place is the ultimate thing that you are hoping to communicate to an audience with your design. That then develops into a series of images, references, sketches and drawings. I might walk past a painting or a piece of skirting board or a colour and just take a picture and send it to Jeremy. There’s quite a protracted process where we’re always reluctant to put anything down too quickly. Then you start playing in a 3D world with a model box. I always knew this was the presentation of an argument and what we’re looking at under the microscope isn’t actually Christopher. We’re not as an audience trying to diagnose Christopher. That might be part of the game that you play as an audience member but what you’re really doing is trying to understand how these doctors are arriving at these diagnoses or theories and the words that they use to bolster and strengthen that and the understanding that they might not necessarily be doing it for absolutely Hippocratic reasons. Do you think there has been a recent shift towards an increasing representation of science and medicine on stage or have these subjects always been ripe for exploration in theatre and the arts? I don’t personally feel like there’s been a shift. I think theatre can only ever respond to the here and now and particularly in the writing of new plays. Would somebody say that Alistair McDowall’s X at the Royal Court is an exploration of science when it’s set on a space station in Pluto? Ultimately it’s about the breakdown caused by isolation and loneliness. A play about science is still a play about human experience and I think these questions have always been asked whatever the current thinking of the time was. You could argue that The Alchemist by Ben Jonson is a play about the modern contemporary science and understanding of how elements may work. You could argue that Doctor Faustus with his investigations into magic and the occult is an exploration of science. I think people are finding more interesting ways of putting stories about scientists and physicians and medical practitioners and engineers on stage. That’s possibly got something more to do with a slightly liberated way of approaching theatre that isn’t so bound by dialogue, dialogue, dialogue, next scene, dialogue. People are playing with projection and elements and smells and sounds. Is Peter Brooke’s The Valley of Astonishment, exploring synesthesia a play about science? Or is it a play about human experience?